After Tokyo, Osaka is the 2nd largest city in Japan. Once a booming port and industrial center, visitors now flock here to get a taste of Osaka’s famous cuisine. Umeda, Japan Our 4.5-Star classification designates those properties with well-appointed, deluxe accommodations, extensive amenities and comprehensive guest services. Expect attention to detail and a warm and hospitable staff ready to cater to your needs. These superb properties offer a truly refined getaway. Half star indicates that the hotel/resort meets all criteria of the designated rating and exceeds in certain areas. 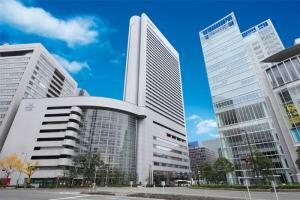 Directly connected to Grand Front Osaka Mall, this hotel provides easy access to the airport, rail system and tourist spots. Nanko, Suminoe Our 4.5-Star classification designates those properties with well-appointed, deluxe accommodations, extensive amenities and comprehensive guest services. Expect attention to detail and a warm and hospitable staff ready to cater to your needs. These superb properties offer a truly refined getaway. Half star indicates that the hotel/resort meets all criteria of the designated rating and exceeds in certain areas. 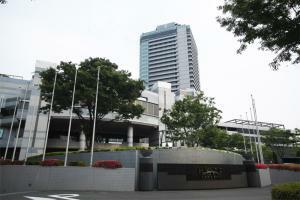 This upscale hotel on Osaka Bay is conveniently located to Universal Studios Japan® and other popular attractions. Higobashi, Japan Our 5-Star classification designates those select properties that provide exquisite service and amenities. The discriminating traveler will find the accommodations, ambiance, dining, and staff assistance of the highest caliber. These properties offer the utmost in luxury and will provide an outstanding experience. This Osaka hotel has a prime location for exploring Japan's rich history, cuisine and cutting-edge entertainment.